State Senator Nate Boulton wants an ethics committee to dismiss a sexual misconduct complaint filed against him last month. 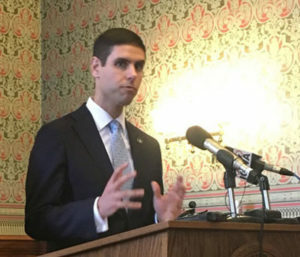 Boulton is a Democrat from Des Moines and says the alleged misconduct is beyond the scope of the committee, as it happened before he was elected in 2016. Boulton also issued a response that challenges Des Moines attorney Sharon Wegner’s claim that Boulton grabbed her inappropriately several times at a Des Moines bar in 2015. Boulton says he has “no memory” of the incident and included affidavits from at least one person who claims she witnessed Wegner act in “a flirtatious manner” with Boulton at an event. The Senate Democratic Leader has said she is waiting to make committee assignments for Boulton until the Senate Ethics Committee completes its investigation.